For the second time I have been awarded with The Liebster Blog Award! This time by lovely Jannie of the blog Vintage Window. With this award follows eleven questions, and I always enjoy reading these questions and answers on blogs I follow. I think this is a really good way of getting to know the writer behind the blog a bit. So here comes my answers to the questions Jannie sent me! 1. Have you ever had regrets about wearing vintage & said to yourself: "Enough is enough...!?" NO! I have never regretted wearing vintage! Sometimes going to the ladies room might be a bit trickier, but it's totally worth it! 2. What is the dearest vintage item in your possession? Difficult question...I have so many pretty dresses I love to wear over and over again. 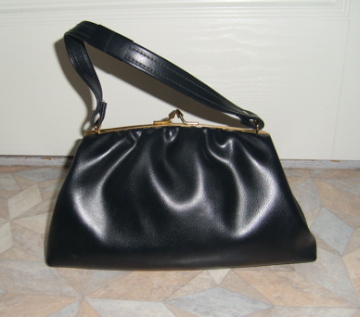 But the vintage item I use the most is the bag in the picture below. It used to belong to my grandma, who now is 95 years old and always want to see what new vintage pieces I have bought every time she visits. The fact that I use her old hand bag she thinks is really funny! 3. What do you put under your shoes when they need new soles? I actually just have two pairs of vintage shoes. The rest are newly produced, but usually with a 40s, 50s look. When they need to be reshod I just bring them to a good shoe repairer! 4. Are you the only one in your family, who wear or live vintage? 5. For how long did you wear or live vintage before starting to blog? I have always loved dressing up, and loved going through boxes of old clothes on the attic already when I was little. But I didn't become a "real" vintage wearer until just a few years ago. So I think I had been wearing it for maybe about a year or two when I started this blog. 6. Many vintage lovers also seem to be cat lovers - are you fond of cats & if you are why? 7. What season is the best & what is the worst for wearing vintage? Since I love pretty dresses, I would say summer is the best season for showing them off! The colder seasons are great for hats, gloves, fur stoles and things like that. But living in Sweden I love when it gets so warm outside I can take off those heavy pieces of clothing and just skip around in a flowy dress! 8. Do you make your own vintage style clothing & if you do, please show us some examples! 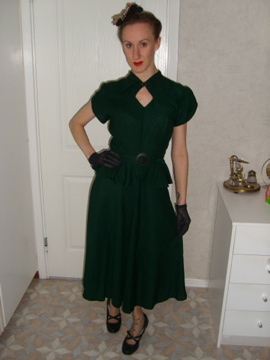 Late 40s dark green dress with peplum belt. 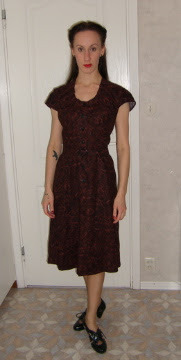 40s dress with buttons in the front. 9. Have you ever persuaded anybody to start wearing vintage - if you have, what was your best argument? No, I have never persuaded someone to start wearing vintage. During shopping sprees I might have told someone to get a vintage, or vintage inspired, piece of clothing though - simply because it looks good on the person in question. 10. Does wearing or living vintage also affect the way you speak? 11. Could you tell us either a joke or a riddle about the vintage lifestyle? 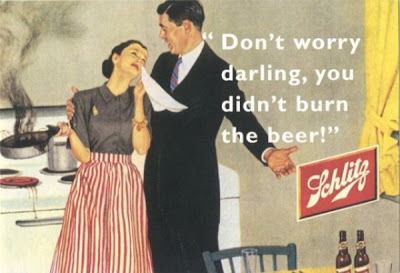 Well, I have to say I really enjoy really sexist vintage ads! If an ad like this was put up today, it would be taken down pretty fast. But that they were serious about these during the decades they were actually used, and also thought that it was completely normal and ok, is something I find pretty hilarious! The one below is one of my favorites! 3. Give the award to five other bloggers - preferably bloggers with less than 200 followers. 4. Answer the 11 questions asked, and create 11 new questions to the five bloggers you award yourself. 1. Vivien of Quaintrelle Life. 2. Ms. Lucero of The Mariposa Chronicles. 3. Madeleine of Le Cabinet de Curiosité de Madeleine Miranda. 4. Jip of Old-Fashioned at Heart. 5. Isis of Isis' Wardrobe. 1. If you could invite four persons - living or dead - for dinner, who would those people be, and why? 2. Has anything supernatural ever happened to you? If "yes", what? 3. What's your favorite piece of clothing - the one you would save first if the house was on fire? 4. Who is your favorite eye-candy? 5. If you could only listen to one song for the rest of your lives, which one would it be, and why? 6. What's your dream destination? 7. What's the craziest thing you have ever done? 8. If you could only live beneath either the sun or the moon, which one would you choose? 9. What's your favorite era when it comes to fashion? 11. What is the one thing you really want to do before you die? So, there you go! If the five of you accept this award, don't forget to hand it over to five blog-choices of your own! Brilliant answers, so full of beauty, wit & humour just like the rest of your blog! The fact that you made all of those outfits is amazing Miss Meadows, we can add being a wonderful seamstress to your burgeoning collection of great talents. I loved your answers especially since they were all related to vintage things because I get so interested by that kind of thing and you're the most knowledgeable on the subject on here. Congratulations on winning the award too, I think that we're all glad that you're the "weird" one in your family because you're amazing the way you are! Congrats on your new award! And no, one can NEVER have too many vintage things!